The discovery of fire and the ability to cook raw meat shaped human evolution. It provided more advantages for humanity than just a better meal. Nutrition improved, which affected fertility, which expanded populations. Hunting, and the consumption of meat, whether killed or scavenged from carcasses, pushed humans all across the globe. “Meat consumption is threaded throughout human history, culture and even genetics. The history of life on Earth is a history of eating meat,”says Marta Zaraska, author of the book Meathooked. Extracting more nutrition from cooked food allowed the stomach to shrink and our brain to expand, according to Richard Wrangham, author of "Catchig Fire." This practice put humans on the path to develop into what we are today. Early humans got much of their meat from scavenging as opposed to hunting dangerous game. However, at some point — possibly as early as 1.9 million years ago — some early humans learned that cooking food made it tastier and easier to eat. Primatologist and anthropologist Richard Wrangham writes in his book, Catching Fire: How Cooking Made Us Human, that the procurement and cooking of meat nourished early humans, changing their bodies, altering their social structure and giving them a good deal of spare time. Cooking food allowed the human body to get more nutrients out of it, providing early humans with increased energy. In addition, cooking reduces the amount of chewing needed to break down the food, particularly for meat, giving our early ancestors hours of time they had not had before. How much time did they gain? According to Wrangham, if we ate a raw food diet comparable to that of great apes today, we would spend approximately five hours a day chewing. Our bodies adapted to eating cooked foods. Extracting more nutrition from our food allowed the stomach to shrink and our brain to expand, according to Wrangham, which put humans on the path to develop into what we are today. Zaraska contends that the development of larger brains gave early humans the ability revel in the thrill of the chase. And that meant hunting grew in importance. Hunting brought about several key changes to the early human society. 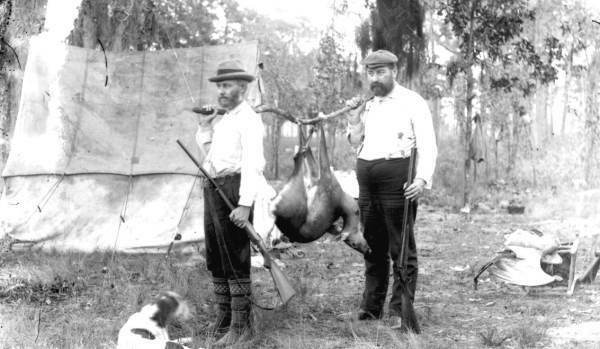 First, hunting impacted social structure through the creation of division of labor: men became hunters and warriors, and women prepared the food. Secondly, it pushed people to become nomadic in the pursuit of game to eat. This meant that humans spread out across the globe. Our ability to procure and eat meat allowed humans to adapt to virtually every climate and environment on Earth. The thrill of the chase and the desire for the nourishment of cooked flesh are at its roots, primal, and the instincts to provide and protect still run deep in modern-day hunters. Even as late as 150 years ago, our approach to hunting was as primal as that of our Paleolithic ancestors. A primal approach to hunting, for example, would never limit the take of game. But we have seen an evolutionary change that blends our primal instincts with our reasoning abilities. As modern-day sportsmen, we have the opportunity — and responsibility — to do what the early hunters could not do: selectively take game animals, to care for the environment and to fight for access to land.